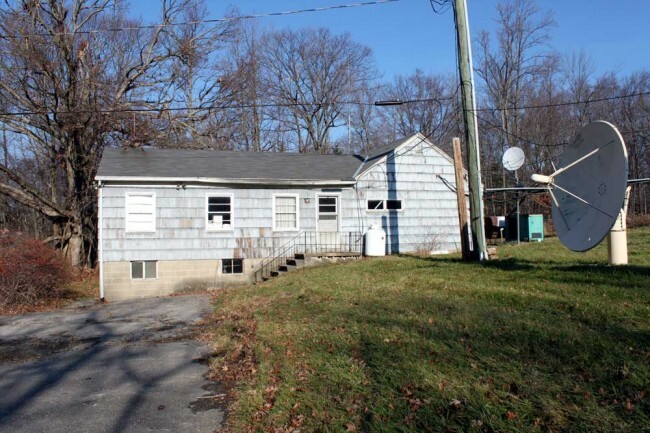 The rest of the building is in similar condition. Ceiling tiles are falling off the ceiling and getting ground into the floor, junk is pile up in almost every corner, rodent feces, and the basement, don’t even get me started on the basement. Right now, the preliminaries are being done, mounting the coax switch, running conduit, pulling wires, etc. 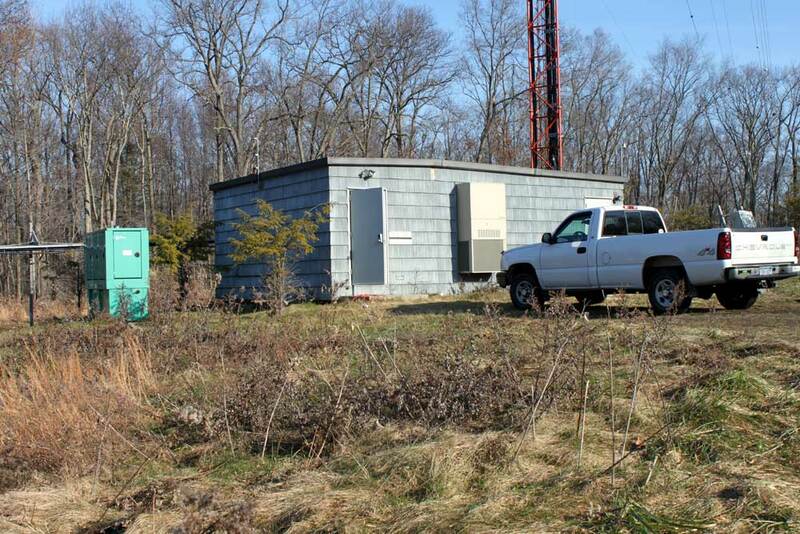 This building is much closer to the tower, which is sited on a high hill (715 feet, 218 Meters) and sticks up 500 feet (152.1 Meters) above that. Basically it is the area lightning rod, thus special attention will need to be paid to grounding and bonding. I decided to isolate the electrical ground in favor of the RF ground for lightning protection. This involves putting toroids on the electrical ground conductors. The building itself is shielded with continuous steel plating, but that has been cut in a few areas to install air conditioners. Those areas will have to be repaired and the AC units bonded to the steel plate. Back up cooling will be in the form of a large exhaust fan and intake louver. The tower itself is AM radiator for WINE. It is 170 degrees tall, which means high RF fields at the base, therefore good RF bypassing is needed. The transmitter room itself is fairly small for what needs to go in there. careful design and placement is required. The first order of business was retuning a Harris FM3.5K transmitter to function as the backup. The current backup transmitter is an RCA FM20E, which no longer runs. 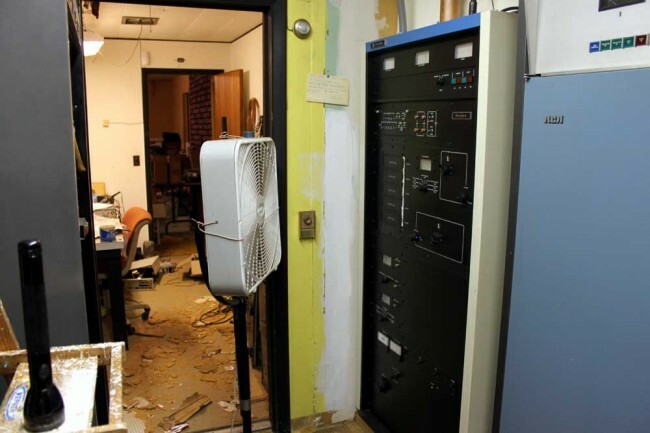 After the move is completed, that transmitter will likely be scrapped. I attached super strut to the ceiling at four foot intervals. I used this strut to support the 4 port coax switch. 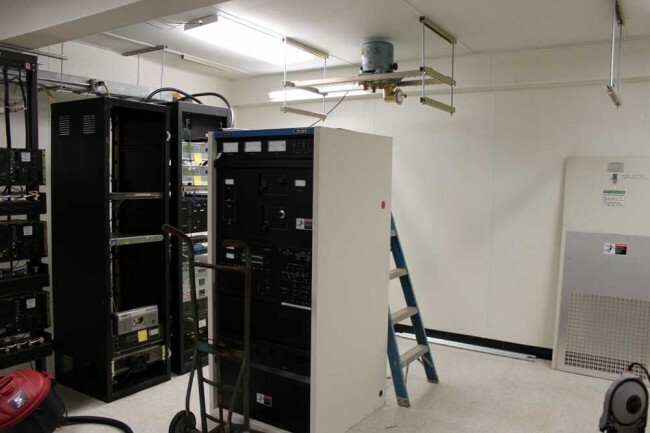 All coax in the transmitter room is 3 1/8 inch hardline, which has a power rating of 40 KW. 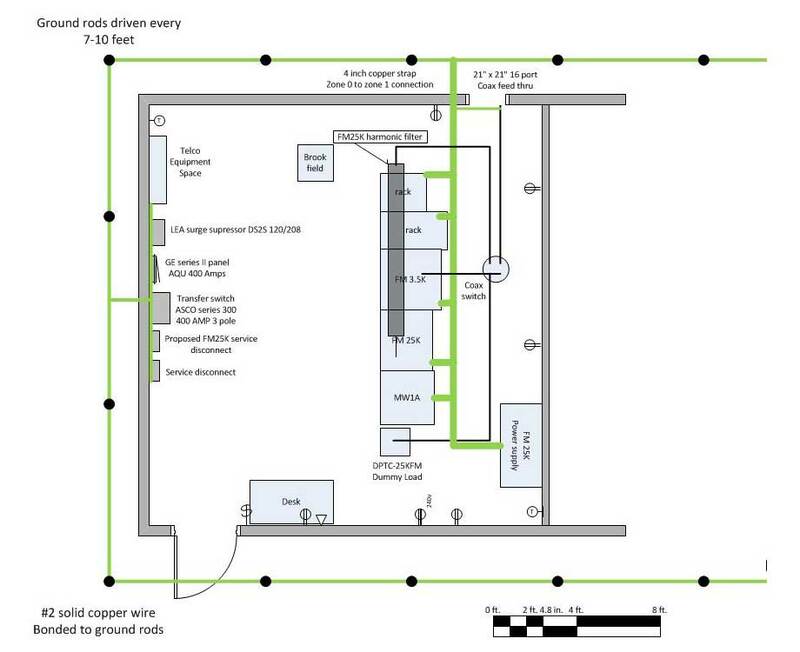 Since the transmitter power output is 20 KW, this leaves a lot of head room for problems. When working with 3 1/8 inch coax, it is important to remember to cut the inner conductor 1 1/2 to 1 3/4 inches sorter than the outer conductor, otherwise the stuff doesn’t go together right. 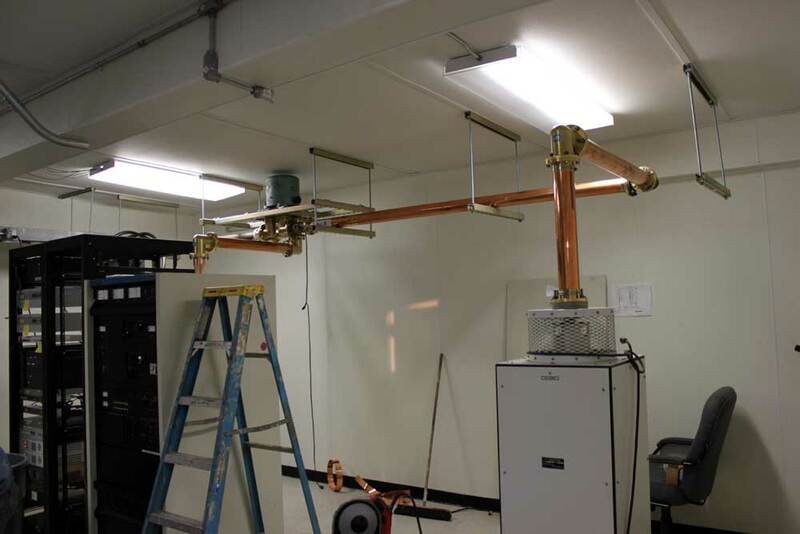 The 30 KW air cooled dummy load was moved up from the other building and connected to the coax switch. This allowed the backup transmitter to be tested. Three inch ground strap connects all the transmitters, racks, and dummy load to the station ground. Electrical requirements are being met by a 400 Amp service backed up by a 120 KW generator. 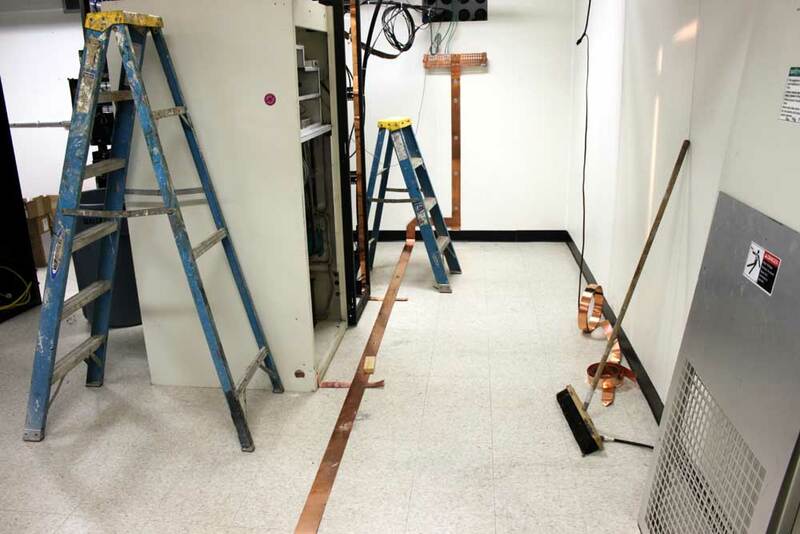 Once the conduit work is finished and all the wires pulled, the coax to the old building can be cut and brought into the new building, then the station can go on the air with the “new” backup transmitter.